Journal Club 11-5-16 | Passive Income M.D. Jamie Fleischner of Set for Life Insurance is on the hot seat this week! What’s the end point for all the money you make and save? Are you trying to build the biggest nest egg or trying to save for the biggest inheritance? Wealthy Doc addresses this issue in Should We Plan to Die Broke. I’m not a radiologist but I know myself and plenty of other doctors are always looking for ways to find additional income streams. Radsresident comes up with a nice list of different things you can do with your medical degree outside of practicing clinical medicine in Alternative Careers and Supplemental Income for the Radiologist. Keeping on the subject of doctors pursuing other ventures, if you haven’t heard of Docs Outside the Box yet, you need to check out his podcast! Listen to one of my favorite episodes with the doctor from the Vistaprint Commercial and hear how Dr. Diamond built a business around the emerging trend of concierge medicine in Your Private Doctor Will See You Now. I addressed the idea of happiness in my post this week. 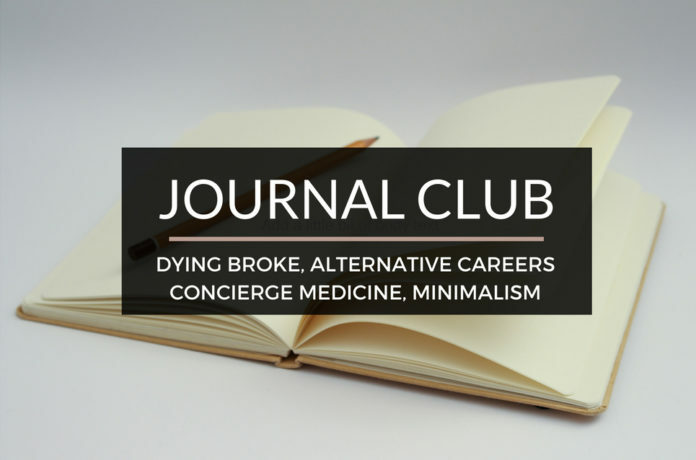 I love reading different angles on the happiness issue and the idea of minimalism always seems to pop up like it did in PoF’s post (mentioned in a previous Journal Club.) One of my newest go-to financial blogs, Financial Libre, goes deep into the mindset of a minimalist and explores Why Minimalism Makes You Happy. Knowing friends, colleagues, other physicians, other bloggers are actually reading this blog has kept me accountable to follow the things I preach. How I spend my time and money is at the heart of everything and part of the place I struggle is giving up on opportunities to make money, especially in my day job as an anesthesiologist. Giving up a shift at work is mentally like giving up X amount of cash. For example, if I give up a shift to go to dinner, it sneaks into my head that that dinner cost me whatever the dinner was plus the lost income. However, I’m trying to free myself of this. Anyone else dealing with the same thing? Sure, I missed out on an opportunity to make money, but I’ll look back on this fondly year after year. Also this was an opportunity to go out with my wife without the kids, priceless! Thanks for your continued support of the site. Have a great week! I see that you often put a dog in your ads, what’s with that? Well, I’m a huge dog fan. I have 2 Border Collies! You also mention that women can save more with your company. I want to know, how exactly do they save more? We have unisex, discounted rates set up throughout the country. Women pay twice as much as men do for disability insurance. Therefore, if a woman can obtain a unisex rate, it negates this disparity and reduces the rate by 50%. There is an additional 20% discount which results in about a 70% discounted rate. Men are not paying more for these rates since there is a discount. Their net discount is about 15%. Next articleHas Medicine Become a Flock of Super Chickens?